Independent Directions to this Site: From Highway 417 (The Queensway) take exit 134 (Moodie Drive). If travelling west, the 0.4 km offramp dumps you right or north onto Moodie. If driving east, a 0.3 km offramp brings you to Moodie Drive, where you will turn left or north onto it and in 0.5 km join the westbound offramp traffic. Both groups will now follow Moodie Drive north 1.3 km from here to Carling Avenue. Turn left or northwest on Carling and go 1.1 km to the parking lot turnoff for the Carling Avenue Trail. Turn right or north into the lot. Ottawa River West: Ontario Route Directions: From the northwest end of Grandview Drive,return along it southeast 1.7 km to Carling Avenue. Turn right or northwest onto Carling and go 0.9 km to the parking lot for the Carling Avenue Trail. 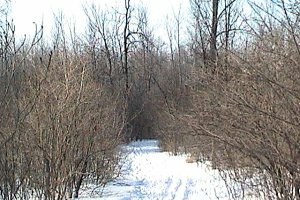 Site Description and Birding Information: Trail # 10 makes a 4 km loop in the greenbelt area bounded by Carling Avenue, Grandview Drive, the Ottawa River and Range Road. There are several alternate loops. There is a good variety of habitat, including a stretch along the river and some small ponds. Blue-gray Gnatcatcher has been seen here. 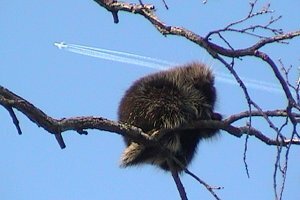 Porcupines are commonly seen sleeping in trees along this trail in winter. Ottawa River West: Ontario Route Directions: From the parking lot for the Carling Avenue Trail, turn right or west onto Carling and go 1.2 km to Rifle (Range) Road. Turn left onto the southern extension of Rifle Road and drive 0.5 km to the end of the street and park off to the side at the next site, Watts Creek Trails.